Want to Live with a Cool Cat This Summer? When the days get long and hot, you can strip down to shorts and a tank top, but your cat has to wear a fur coat all year long. 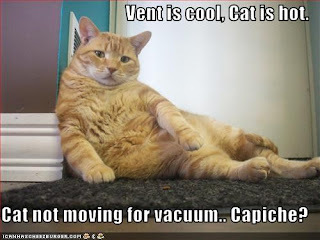 So what can you do to keep your feline friend comfortable during the summer? Cloth-covered plastic frames with short legs will allow your cat to sleep in comfort, and the air passing under her bed will help to keep her cool. Get a small box fan and set it on the floor near your air conditioner or an open window. If your kitty gets too hot, she’ll appreciate the breeze blowing through her fur. For extra cooling power, put one of those frozen water bottles in front of the fan. … not even for a quick errand. A closed car can reach temperatures well over 100 degrees in a frighteningly short time.